The Japan Water Forum (JWF) attended the 2nd Stakeholders’ Consultation Meeting, held on April 26 and 27 in Brasilia, the capital of Brazil. The World Water Forum is the biggest water-related international conference and exhibition, which takes place every three years. The 8th Forum will be held under the overarching theme Sharing Water from March 18 to 23 in Brasilia in 2018. According to the organizers, approximately 800 participants from more than 70 countries attended the consultation meeting. Debates focused on the basic concept of sessions dealing with each of the five processes: Thematic Process, Political Process, Regional Process, Citizen’s Forum Process, and Sustainability Focus Group. I will make a brief report on the meetings for the Regional Process and Thematic Process, in which the JWF participated. ○JWF attended the meeting as representatives of the Asia-Pacific Water Forum, which serves as regional coordinator for the Asia-Pacific region. We shared information about topics to be focused on in the Asia-Pacific Regional Process and the work plan leading up to the 8th Forum. Therefore, sessions of the Regional Process will be jointly organized by several regions under each of the six themes: Climate, People, Development, Urban, Ecosystems and Finance. 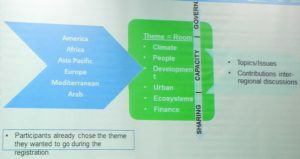 Each region will choose one topic under each of the six themes. Those regions that choose the same topic will organize a session together, noting the differences and similarities between the regions, and share the solutions of water issues. The main focus of the Regional Process is sharing lessons learnt from case studies in sustainable water management. In contrast, the Thematic Process will be technical, analytical and theoretical. 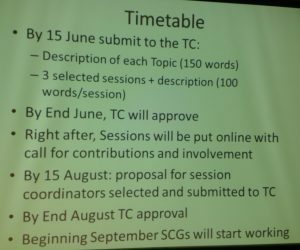 Details including future tasks, schedules, and the number of sessions for the Regional Process will be decided through discussions at the World Water Congress, held from May 29 to June 1, in Cancun, Mexico, and at the International Steering Committee (ISC), to be held in August. ○Some participants expressed concern that the Regional Process might lose its own identity as sessions would be designed under the themes set by the Thematic Process. ○It was announced that about 100 sessions would be held under the Thematic Process, with a three-layer structure: 9 themes, 32 topics, and 100 sessions. Topic coordinators selected from the different organizations will work together to organize and coordinate a few sessions under each topic. ○The schedule was released as follows. ○A leaflet was distributed about the terms of registration and the fee. ○A leaflet detailing the first announcement was handed out. Information about registration and exhibition booths is expected be posted on the official website of the 8th World Water Forumsoon. Finally, each Process will proceed based on the opinions presented at this consultation meeting. The JWF will provide the latest information about the 8th World Water Forum with regular updates on our website.